Helping the Planet, One Burger at a Time - Integration Through Media ....! (VOA): Chef Rob Morasco didn’t set out to make a planet-friendly burger. But the 25 percent mushroom burger he created at food service company Sodexo not only has a lower carbon footprint, it’s also lower in calories, fat and salt. It’s juicier, too. “When you bite into it, it’s kind of like a flavor explosion,” Morasco said. “And you don’t taste the mushrooms, either.” And because mushrooms are cheaper than beef, he could answer customer demand for antibiotic- and hormone-free burgers “without having to jack up the price,” he said. Mushroom-blended burgers have been catching on among both chefs and environmentalists. In March, Sonic Drive-In became the first fast-food chain to offer them. WATCH: These Burgers Are Better for the Planet, but You'd Never Know It ​2 million cars Americans eat about 10 billion hamburgers each year, according to the World Resources Institute (WRI). All those burgers take a toll on the planet. Beef is “the most resource-intensive food that we commonly eat,” Richard Waite of WRI said. Beef accounts for about half the greenhouse gases produced by the American diet, he added. Cows take far more feed, land and water than any other source of protein. If every burger in America were blended with mushrooms, WRI estimates the greenhouse-gas savings would be like taking more than 2 million cars off the road. It would save as much water as nearly 3 million American households use in a year. And it would reduce the demand for farmland by an area larger than the state of Maryland. For the carnivore Blended burgers are part of The Culinary Institute of America and Harvard T.H. Chan School of Public Health’s Menus of Change project, challenging chefs across the food industry to make their meals healthier and more sustainable. Demand for meatless meals is growing along with rising health and environmental concerns. There are bean burgers, soy burgers, even beet-infused veggie burgers that “bleed.” But it’s a limited market. “The veggie burgers tend to cater to folks who identify as vegetarian or vegan, or actively want to be eating less meat,” Waite said. On the other hand, blended burgers appeal to “the real carnivores, someone who really loves meat,” he added. “This is potentially a dish that could have broad mainstream appeal and also pretty big environmental benefits.” Helps keep burgers juicy Chefs say the mushrooms retain water, helping the burger stay juicy as it cooks. Sonic Drive-In’s ads for its new Signature Slinger blended burger play up the juiciness and the lower calories. “When you’re about something that is going to be better for you, it had better deliver the flavor first,” said Scott Uehlein, vice president for product innovation and development at Sonic Drive-In. 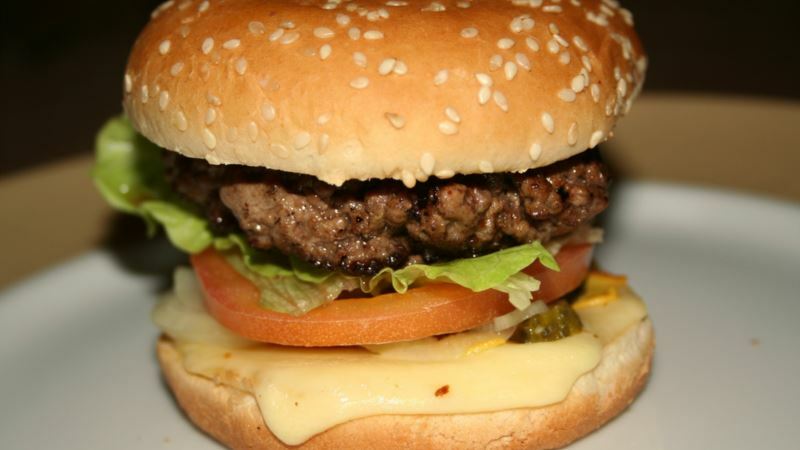 The company is piloting the burgers in a two-month trial run. And the potential goes beyond burgers. About 400 cafeterias, universities and hospitals are using Sodexo’s blended beef to prepare not only burgers, but lasagna, chili, meatballs, meatloaf and more. The company has adapted 30 popular recipes to use its mushroom blend. “All those different things you can make with that product just like you would make with regular ground beef,” chef Morasco said.